Last New Year’s Eve, my friends Tim, Liz and Katy, who had plans to rent an apartment in Florence for a week as part of an extended visit to Italy, invited me to join them for the Northern Italy portion of their adventure. How could I pass up a return visit to Italy? Yet, a year after my last visit to Rome and the Amalfi Coast, I was still asking the question: Why, with so much coastline and so many lakes, does Italy not produce great oysters? 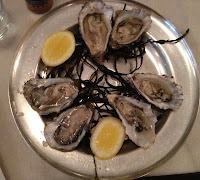 I touched on that in my July, 2011 posting on Rome’s Leading Oyster Aficionada: Emanuela Gismondi of Tuna. Fortunately, I knew that there were more great places to enjoy oysters (albeit “foreign” oysters) elsewhere in Italy. So, starting in Florence, the search began. 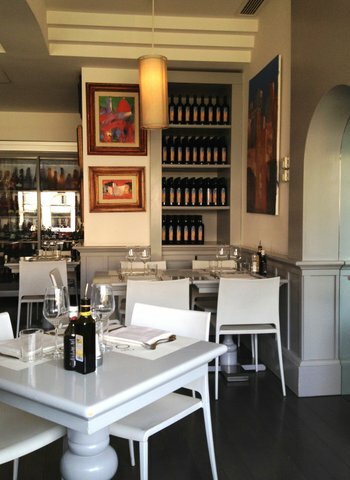 Katy had found a wonderful apartment in central Florence, just steps away from the Duomo. It served as the perfect base for exploring the city – and beyond. Towards the end of our first afternoon wandering around the city, Katy and I crossed the Ponte Vecchio and strolled into the Oltrarno district. Taking a left at the foot of the bridge onto Via de Bardi, we quickly came across a sign reading “Goldenview Open Bar”. Aside from the fact that “open bar” is one of my favorite phrases in the English language, the brilliant seafood display (with oysters) in the window was compelling. Since we had just finished a late lunch less than an hour before, we were not quite ready for another break for food and drink. Of course, we knew we would return to Golden View Open Bar very soon. 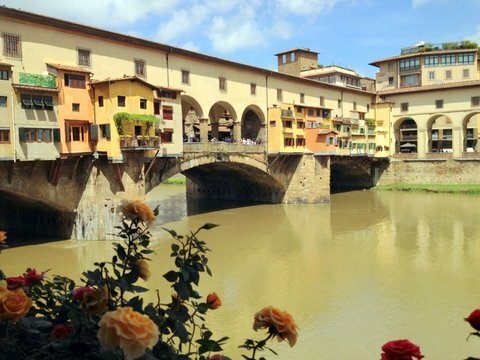 The next evening, we were seated on a terrace overlooking the Arno, taking it in as the setting sun transformed the hues of the medieval Ponte Vecchio. All tolled, over the years, I have spent almost a month in Florence. I have to admit, of all the restaurants I’ve been to in the city, Golden View Open Bar offered the best view of the river. And the contemporary minimalist interior design was almost as impressive as the enchanting view from the terrace. Since the restaurant was not primarily an oyster bar, the waiter had to send over a manager to talk about the restaurant’s oysters. Referring to the Emporer Nero’s legendary love of oysters, he apologized for not having any native to Italy “that afternoon”. He did, however, offer us Fines de Claire oysters for €3.5 a piece. While Fines de Claire from France are considered by some to be the best oysters in the world, my mind is not yet made up on that subject – and I am still thoroughly enjoying my search. That having been said, Fines de Claire, which offer a slight hint of hazelnut, have long been towards the top of my list. We were just sips into our first glasses of non-vintage Laurent-Perrier Champagne when the oysters arrived, along with a basket of focaccia. 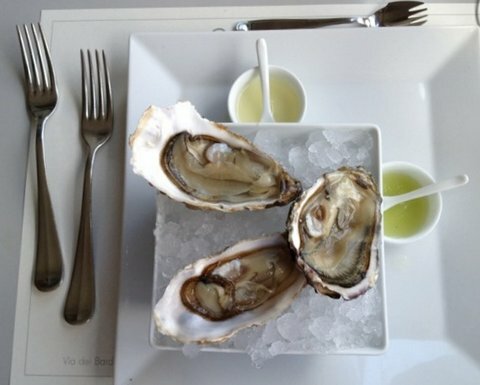 A small ramekin of lemon juice, and another with a light cucumber sauce, were placed along side the oysters. Generally, I eat my oysters naked (that is, the oysters are unenhanced with sauces or toppings. I’m not naked!). That way, I may thoroughly enjoy the flavors offered. However, we were intrigued by the cucumber sauce, so it had to be sampled. Fortunately, the restaurant provided extremely tiny spoons which proved perfect for drizzling. Tasting my first oyster naked, I noted the freshness – and the hint of hazelnut. It was obvious this was going to be a great start to our evening. 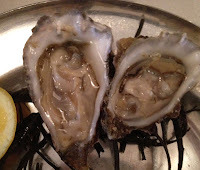 A little more Champagne and I sampled another oyster with a drop of lemon juice, a dash of Tabasco, and a twist of pepper. Again perfection. While the hint of cucumber gracefully complemented the Fines de Claire, one was sufficient for me. For the rest of the afternoon, it was back to naked oysters – and more Champagne. The waiter stopped by to see if we wanted to sample anything else from the menu. When I asked for a recommendation, he steered us to their tartare – another one of my weaknesses. We ordered three: yellow fin tuna, shrimp, and sea bass. As an intermezzo, we ordered a salad with carrots, radicchio and a little fennel. When the tartare arrived, they were accompanied by three ramekins: cucumber sauce, lemon juice, and a light tomato sauce. The sea bass was incredibly fresh and the shrimp was tender and sweet. It must have been market day! The tuna was just okay. (We had seen the tuna in the window a few days before, so it is quite possible it was not as fresh as the sea bass and the shrimp). 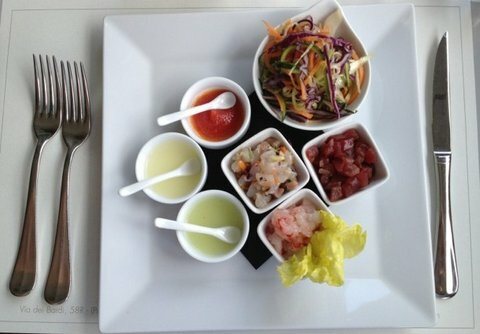 No matter which combinations of tartare and sauces we tried, they all worked well together. Two afternoons later, we were back at Goldenview Open Bar for another little snack. 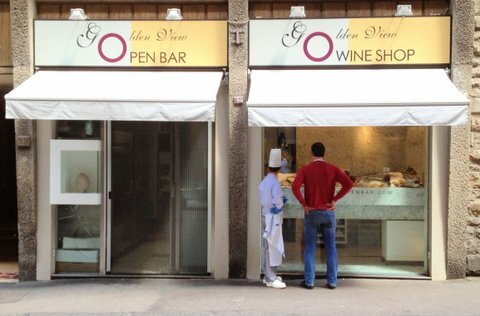 And next time I am in Florence, I know where I’ll be spending an evening or two. 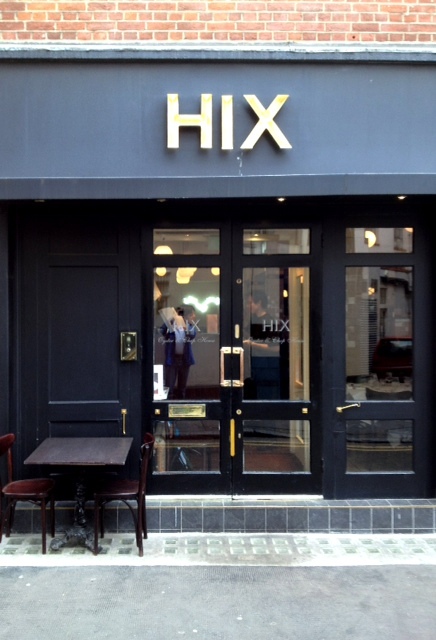 Chef Mark Hix opened his first restaurant – Hix Oyster & Chop House – four years ago. Since then, he has opened an additional five London restaurants featuring creative British cuisine. 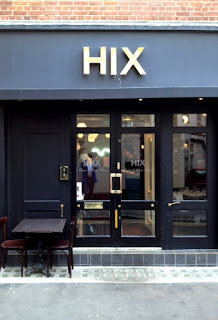 I recently stopped by Hix, located just steps from London’s historic Smithfield Market, to chat with chef Martin Sweeney. I sat at the marble oyster bar, listening to Martin speak with pride about oysters from the British Isles. At the outset, he explained that during the months without a “R”, Hix, like all restaurants in the UK, serves only rock (farmed) oysters. The rest of the year, native oysters are available. Martin brought over a small platter with three pairs of oysters for us to share. He pulled me a pint of local beer. The chunky oyster was great. Clean, with a bit of a mineral finish. These plump oysters sat deep in their shells. 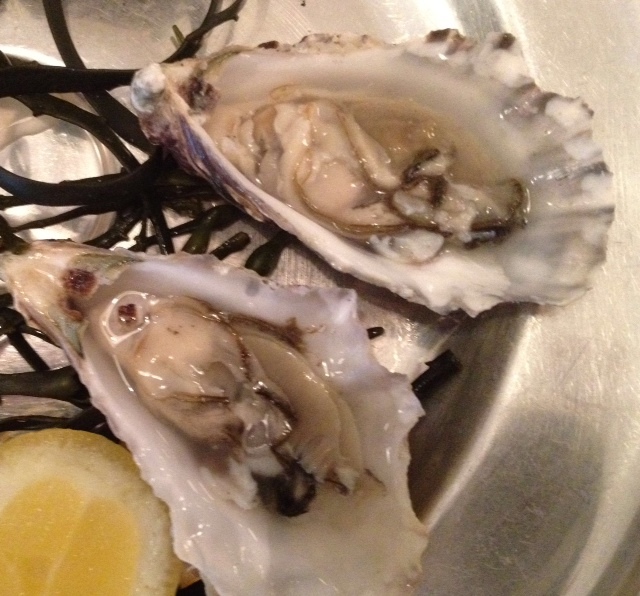 They tasted nutty and significantly saltier than the Elbury Cove oysters. My final oyster was from the Camel Estuary on the north coast of Cornwall. It was massive and meaty, with a slight crunch. And as it turned out, my favorite of the three offered. The after work crowd had begun to trickle in, and Martin had to head back to get the evening started. I’m glad I had the chance to stop by.